» Reviewed by William F. Deeck: JOHN ROEBURT – Corpse on the Town. Reviewed by William F. Deeck: JOHN ROEBURT – Corpse on the Town. 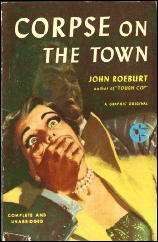 JOHN ROEBURT – Corpse on the Town. Graphic #27, paperback original, 1950. Revised edition: The Case of the Hypnotized Virgin. Avon #730, pb, 1956. Reprinted: Belmont/Tower,1972. About to check in to his terminal in New York City, cab driver J. Howard Moran, better known as Jigger, agrees to take a trunk to the Railway Express Office. An unknown someone meanwhile has informed the police that the trunk in Jigger’s cab contains a corpse. Which it does, the body of a young woman whose face is battered beyond recognition. Apparently Jigger. a disbarred attorney in Illinois and a private eye without a license, has investigated other crimes before, though this is his first recorded case. He and his reluctant assistant, Red, “free-lance journalist and improvident writer of plays, features, fiction, columns,” try to determine the woman’s identity and find her killer. As the police follow Jigger closely with the thought that if they can’t convict him maybe he will be able to pin it on someone else, Jigger manages to come up with the answer. For his novel Tough Cop, Roeburt won an Edgar, or so the publisher of this novel claims. I have not been able to identify either the category or the year. This one is no prize winner, but it has its amusing moments. Bibliographic Data: It is perhaps no surprise that Bill was unable to discover the category for which John Roeburt won an Edgar, as the publisher’s claim is not true, as he surmised might have been the case. Jigger Moran (n.) Greenberg, hc, 1944. 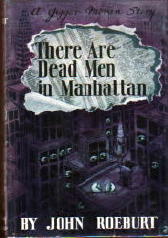 There Are Dead Men in Manhattan (n.) Mystery House, hc, 1946. Corpse on the Town (n.) Graphic, pbo, 1950. In case anyone gets confused there is another “Jigger” out there, Anthony Rud’s Jigger Masters (hero of THE ROSE BATH MURDERS and a ‘yellow peril’ novel THE STUFFED MEN) who is probably best remembered for being singled out in Bill Pronzini’s SON OF GUN IN CHEEK. Thought it best to mention him unless someone get the two confused and put Roeburt in the alternative school for nothing more than a similar name. I haven’t read a lot of Roeburt, mostly his two film novelizations — AL CAPONE and UNHOLY WIFE (John Farrow’s last film from a Jonathan Latimer script) — and his book based on the short lived Warner’sseries ROARING TWENTIES (which for some reason is one of the easiest paperbacks to find — I bet I’ve seen a dozen copies of it over the years — the series was about a group of journalists in the twenties with Mike Roads, John Dehner, and Dorthy Provine as a leggy performer in their favorite speakeasy). His other series character was Johnny Devereaux but I haven’t read any of them. Based on this I may have to check out Jigger Moran. Jigger Masters I am sure I remember from his appearances in the pulp detective magazines, probably DETECTIVE FICTION WEEKLY. I must have read some of them, but nothing stands out or comes to mind. Jigger Moran I confess I have not read either, David. Don’t know why. All three books came out in paperback, and I have them all, so that’s no excuse. I also confess to having no idea why anyone might be nicknamed Jigger. 1. A person who jigs or operates a jig. 2. 1. A small measure for liquor, usually holding 11/2 ounces. 2. This amount of liquor. 3. A device, such as a drill, that operates with a jerking or jolting motion. 4. Nautical. 1. A light all-purpose tackle. 2. A small sail set in the stern of a yawl or similar boat. 3. A boat having such a sail. 5. Informal. An article or a device, the name of which eludes one. You mention THE ROARING 20s TV show, David, although only in passing. I wasn’t able to watch it when it was on, but I now have the complete set on collector copy DVDs, and it’s excellent. It was on for two seasons (ABC) between 1960 and 1962, while I was away at college. Lots of 1920s era Chicago gangsters, and all that entails, and “leggy” is right. John Roeburt is my great uncle who was adopted. My grandmother is his sister. I only wish I knew this before he passed away. His work was amazing and has stood the test of time. I own two Roeburt´s novels(in their Spanish translations) THE HOLLOW MAN – one of Johnny Devereaux´s cases, and DID YOU KILL MONA LEEDS? The former is a very decent “tough cop” mistery, but the later is a great novel in the best noir style. Really remarkable. I’m John’s step daughter. I would love to get in touch with you. I am searching for the contact of John Roeburt’s rights holders and/ or estate. And I was hoping you could maybe help me in my researches. Do you know anything about who to contact regarding the rights of his work? Knowing rights holders for authors’ estates is not my field of expertise, but perhaps someone reading this will know and leave a comment.